The last few years have seen the reemergence of a debate about the severity of the risks of inadvertent escalation arising from the entanglement of non-nuclear weapons with nuclear weapons and their enabling capabilities. The last few years have seen the reemergence of a debate about the severity of the risks of inadvertent escalation arising from the entanglement of non-nuclear weapons with nuclear weapons and their enabling capabilities. Such entanglement has various dimensions: dual-use delivery systems that can be armed with nuclear and non-nuclear warheads; the commingling of nuclear and non-nuclear forces and their support structures; and, most importantly, non-nuclear threats to nuclear weapons and their associated command, control, communication, and information systems. To date, this debate has been limited in at least two critical respects: its participants have been, almost exclusively, American. And, it has focused, almost exclusively, on a U.S.-China conflict. There is, however, no obvious a priori reason why entanglement could not spark escalation in a U.S.-Russia conflict (indeed, the consequences of entanglement were first seriously considered in the 1980s in the context of a U.S.-Soviet conflict). Moreover, given the extent to which perceptions are important in driving escalation, the absence of Russian and Chinese views in today’s debate is a serious weakness. This volume represents an attempt to fill both lacunae. 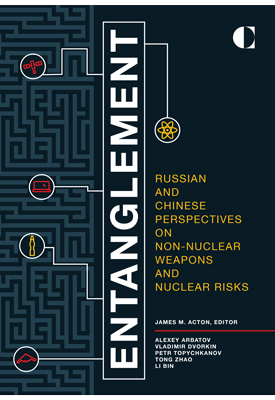 The main authors are some of the most distinguished and well-connected nuclear policy scholars in Russia and China: Alexey Arbatov, Major General (retired) Vladimir Dvorkin, and Petr Topychkanov, and Tong Zhao and Li Bin. These teams set out to answer two questions: How serious are the escalation risks arising from entanglement? And, how do the authors’ views compare to those of their countries’ strategic communities? The conclusion represents my view of the policy implications of their answers. This work would not have been possible without the generous support of the Carnegie Corporation of New York. It would also have been impossible without the willingness of numerous current and former government officials and military officers, defense industry representatives, and nongovernmental analysts to engage with the Russian and Chinese research teams. Given that all of these meetings were conducted with a promise of anonymity, we cannot thank interviewees and workshop participants by name, but we are grateful to them nonetheless.